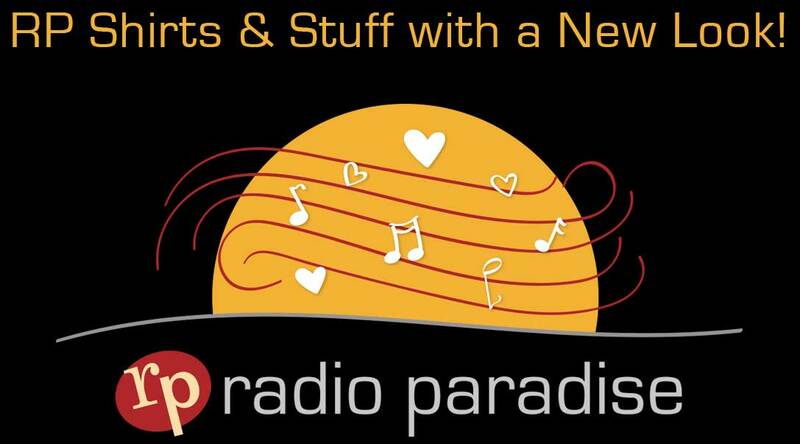 If you're new to Radio Paradise, welcome! We're very glad you found us. If you're already a regular RP supporter, thank you very much. A special thanks to those of you who've become first-time supporters in response to our recent support requests. If not, this would be a great time to start. A 2016 royalty board ruling increased the fees that we pay for the use of music by over 300%. This has been quite a challenge for us. We're happy to provide RP free of charge to everyone, including those of you who aren't able to send support. However, if you can afford to become a supporter — either on a one-time or an ongoing basis — we would appreciate it now more than ever. The artists we play will benefit from your support as well, as at least 50% of the royalties we pay go directly to them rather than to their record labels. You can read more about the royalty issue here. We've also been investing in some very interesting upgrades to the RP listening experience (like our new web player). New designs — and old ones, too — on many styles of shirts, hoodies, cups, hats, buttons, stickers and all sorts of other goodies. A great way to show off your excellent taste in radio stations. Each purchase also sends a little trickle of money our way. RP is not endorsed in any way by amazon.com, but we do earn a small commission through their affiliate program on sales made through our links to various worldwide Amazon locations. These links appear on all song info pages. Anything you buy during a shopping session that starts with one of our links gets credited to our account, including products that you find via a search on Amazon. The Physicians Committee — saving & improving human & animal lives via plant-based diets & scientific research. Plant Perfection — delivering convenient, tasty, health enhancing food. MamaSezz — delicious whole-food plant-based meal delivery service. This is our legacy website. We have a new website and player that allows you to skip songs — like you can with our apps — rather than use the current "PSD" (Play Something Different) function. We're also the first station anywhere to offer lossless FLAC streaming on a DJ-mixed radio stream. Click here to switch to our new site. If you got here via a bookmark, you might want to update that. The new site is not compatible with Internet Explorer. The legacy site may offer better results with some other outdated browsers and operating systems as well. Otherwise we recommend switching to the new site. We've had a bit of a rough transition to our new account system. Our apologies if you've had problems. Everything should work OK now. If not, try clearing all RP cookies and starting over. If that doesn't work, email support@radioparadise.com. The Alexa-enabled Sonos One Smart Speaker is now compatible with RP! It sounds great, and is super easy to use. Just say "Alexa, enable Radio Paradise", then "Play Radio Paradise" and "Skip" to move to the next song on the playlist (just like on any other Alexa device). We were very disappointed by SiriusXM's decision to drop The Loft, their DJ-programmed eclectic music channel. We hope that Loft fans who find their way to RP will find our music mix to be equally entertaining. Don't forget that you can take us with you in your vehicle via our free smartphone apps -- and enjoy audio quality that is dramatically better than what you get with satellite radio, plus our cache feature that allows hours of offline listening. We are very pleased to announce our highest-fidelity stream ever. CD-quality FLAC audio is now available in our free iPhone and Android apps, and our apps for AppleTV and FireTV. We've now added FLAC audio to our new web player (click here to give it a try) and we'll make it available via other hardware and software players as soon as we can. Users of Logitech Squeezebox devices can access it via this plugin. There is not currently a FLAC stream URL you can use for VLC, Sonos, Winamp, etc. The iPhone app requires iOS 11+ for FLAC, and even with that version it will not be available on some older hardware. The AppleTV app works on Gen 4 (Siri remote) devices only. If your device or player can't access FLAC, you can still listen via our excellent 320k or 192k streams. Links to those streams are here. After updating to iOS 11, you may have received an error message when trying to access the RP app on your iPhone. That means that you're using an old version of our app that is no longer supported. Just go to the App Store and download our current app (still free). That should solve the problem — and give you access to several nifty new features: the ability to skip songs, several PSD (Play Something Different) options, and the ability to cache blocks of RP programming on your phone for offline playback. We're very sorry for any confusion. If you have an Amazon Echo or other Alexa-enabled device, just say "Alexa, enable Radio Paradise" to start using our Alexa skill. Once it's enabled, tell her "Alexa, play Radio Paradise" to start listening, then "Alexa, skip" if you don't care for what's playing — or "Alexa, ask Radio Paradise what's playing". When you enable the skill, check the Alexa app to link your RP account & see a list of all of the available commands. RP Slideshow Player, Apps, etc. Click here to enjoy this beautiful visual accompaniment to RP's music, or — if you're a photographer — click here to submit your photos to Mike, our photo editor. You can also enjoy the slideshow in our iPhone/iPad and Android apps (just rotate your screen to the horizontal position), via our free Roku channel, and our new AppleTV app. If you need more info on our apps or on how to listen to RP via Sonos systems, WiFi radios, iTunes, or anything else, just click the Listen/Apps tab above. You'll also find a complete list of stream URLs at bitrates from 32k to 320k, in a variety of stream formats — including audiophile-class high-fidelity streams.